The fall of Kut in late April 1916, when British commander Sir Charles Townshend surrendered his garrison of approximately 10,000 men to the besieging Turk force under Khalil Pasha, brought about a reorganisation of both Turk and British forces in the area. Khalil took the opportunity to pull back his extended line by some 15km, a decision taken with a potential attack through Persia in mind (which in the event never came to pass on account of renewed British success along the River Tigris). Meanwhile the shock of the loss of the Kut-al-Amara garrison - considered by many the greatest humiliation ever to befall the British Army - had prompted the British government in London to revise its view of the Mesopotamian Front. Until the fall of Kut the War Office in London had acquiesced in the Indian administration's management of military affairs in Mesopotamia, even though the latter's policy of an aggressive "forward defence" had caused unease among ministers in London (notably Sir William Robertson). Now, with Khalil's unequivocal victory - and the consequent serious damage to British prestige in the Middle East - London determined to take over handling of the campaign in the region. This resulted in the recall of the unpopular George Gorringe in the wake of his failure to relieve Townshend (although by the time of his appointment it was already arguably too late to relieve the Kut garrison). In his place was appointed the relatively junior Sir Frederick Maude, who eventually came to be recognised as the war's most successful commander operating on the Mesopotamian Front (of all sides). Maude was appointed commander of the so-called Tigris Corps in July 1916 and, the following month, of the entire front. He immediately set about reorganising and re-supplying British and Indian forces in the region. British strength in the region was reinforced by an influx of Anglo-Indian troops, although sickness continued to claim an inordinate number of casualties until Maude finally revamped the British system of medical supplies, virtually non-existent to that point. By October 1916 Maude had 150,000 troops under his command, of which around half were serving on the front lines. He was determined to launch a renewed offensive against Kut before the arrival of the winter floods common to the region. Maude's plans were not however unknown to the local Turkish commander, Karabekir Bey. Overwhelmingly outnumbered by some three-to-one he nevertheless set about reinforcing Turkish trench positions; his calls for reinforcement were however unheeded by Khalil. Along with improvements to the British system of medical supplies great progress was made in improving transport mechanisms, a constant failing to that point. Satisfied that British preparations were approaching completion Maude requested - and after a pause was granted - permission from London for an advance upon Baghdad. Thus the British attack was eventually launched on the night of 13/14 December 1916 on both banks of the River Tigris. Approximately 50,000 men, organised in two corps, were involved in the advance. Progress was slow however, if sure, on account of heavy rain and an overriding concern to minimise casualties (one of London's most insistent demands to Maude). It took a full two months to clear the west bank of resistance below Kut, and included the capture of the fortified Khadairi Bend on 29 January 1917. Crossing the Shumran bend on 17 February 1917 to the right of Turk forces, Maude launched an attack on both flanks. Karabekir Bey, overwhelmed, authorised a skilfully-managed retreat from Kut a week later on 24 February, heavily pursued by a flotilla of naval gunboats (bringing about an action at Nahr-al-Kalek), although British cavalry was unable to provide assistance while placed under fire from well-sited machine guns. Additional difficulties were faced by the retreating Turks in fighting off repeated attacks by local Marsh Arabs, who attacked both sides at every opportunity. The success of the British advance (which petered out on 27 February, some 100km beyond Kut at Aziziyeh) persuaded Khalil to postpone and then abandon his plans for a Turkish sweep through Persia; he also recalled a corps fighting against Russian forces in western Persia to boost his own strength. Buoyed by his success in re-taking Kut, Maude barely paused before pushing on with the advance to Baghdad, which fell to the British the following month. 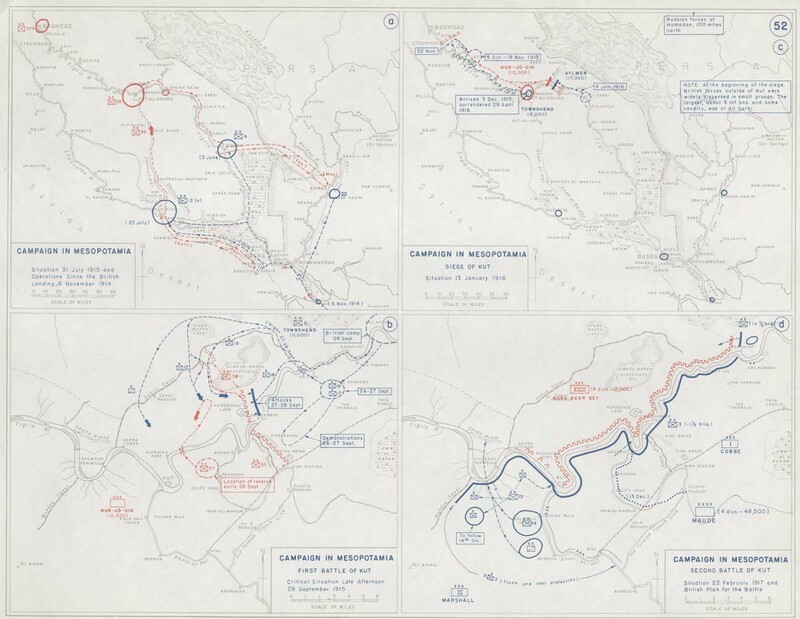 Click here to view a map charting operations in Mesopotamia through to 1917. "Gas Bag" was a slang term for airships.